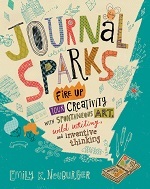 Journal Sparks invites the reader to uncap some markers and sharpen those color pencils. Lists, daily events, observations are all embellished with illustration. Neuberger’s examples, though, are unintimidating to untrained artists. Simple line drawings with a splotch of color will do. In one exercise she suggests just making dots of color and creating new creatures around them. Or filling a page with swathes of color and coming up with new names, like a paint manufacturer. Readers also get a peek inside the journals and the processes of the creative contributors like Keri Smith (Wreck this Journal), and Meghan Burch (formerly with the Eric Carle Museum of Picture Book Art). Something Neuberger and most of the contributors share is a background in arts education. This results in book of projects and inspirations suitable for children, adults – even groups. A section on creative journal-making – from simple saddle-stapled pages, a book made of paper lunch bags, or tiny art journals – can fill the time on the rainy days and lazy afternoons. Journaling enthusiasts and those looking for a creative jump-start will find plenty of encouragement and motivation in these pages. Included at the end is a pull-out section of templates, patterned papers, stickers, and speech bubbles. This entry was posted on March 31, 2017, in Book Review and tagged non-fiction. Bookmark the permalink.